I have a ton of posts I need to get caught up on. I don't know where the past seven weeks have gone. Work has been brutal and the winter really dragged on here, so I think I was just in a funk. I have a few posts that I need to get done, but I made this last night and it was just too good not to post. We are doing a 30 day challenge. We were on our way out to dinner when I told the boy about this, but basically it is an eat at home challenge. You get four freebies, nights out, and of course we already have plans in May, so we actually have plans for five meals out, and we already had a fail. We are going to do our best though. 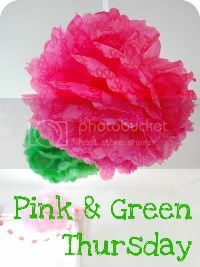 We figure it will help us go through what is in our fridge and freezer, lose weight and save money. I am excited to see how it works. The pork chops were one of the first things I pulled out of the freezer that I knew we needed to use. The boy came home from work, I finished up a conference call and we headed out for about a 30 minute walk. I thought it would be 7 before we sat down to eat, but I was pleasantly surprised that this only took about 30 minutes to make from start to finish and we were sitting down to dinner at 6:30 without a problem. 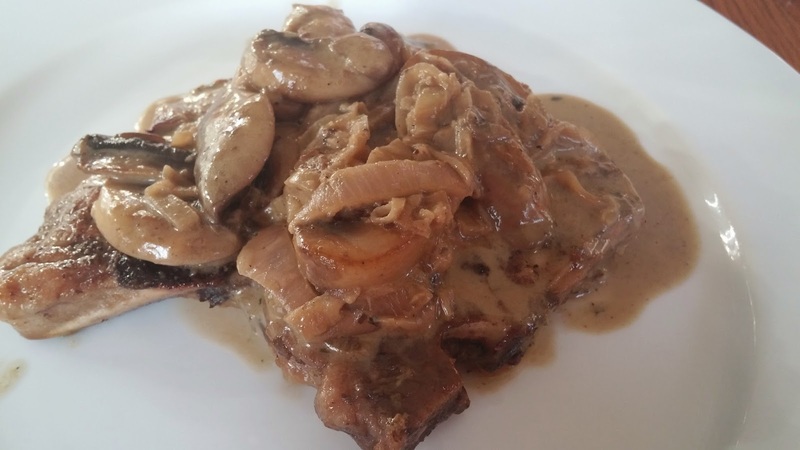 I got my inspiration from this recipe for black iron skillet pork chops with mushrooms. Salt and pepper both sides of the chops thoroughly. Heat the olive oil and butter in the pan, once it is heated, add the pork chops to the pan. 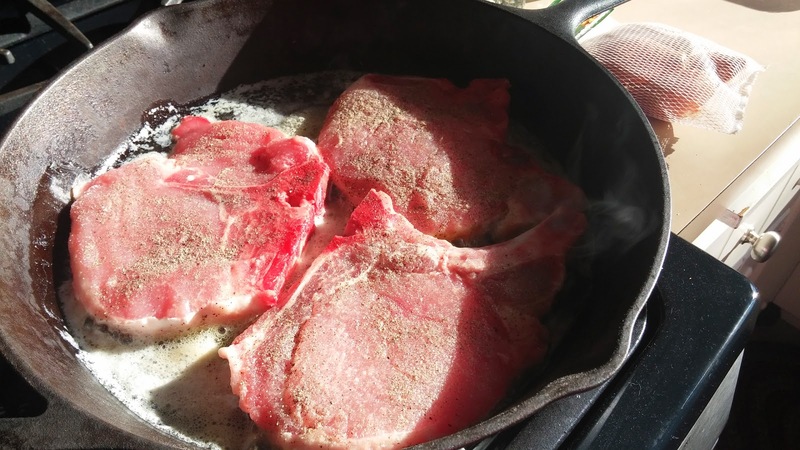 Remove chops from pan once heated and browned on both sides. Cover with foil and keep warm in oven. 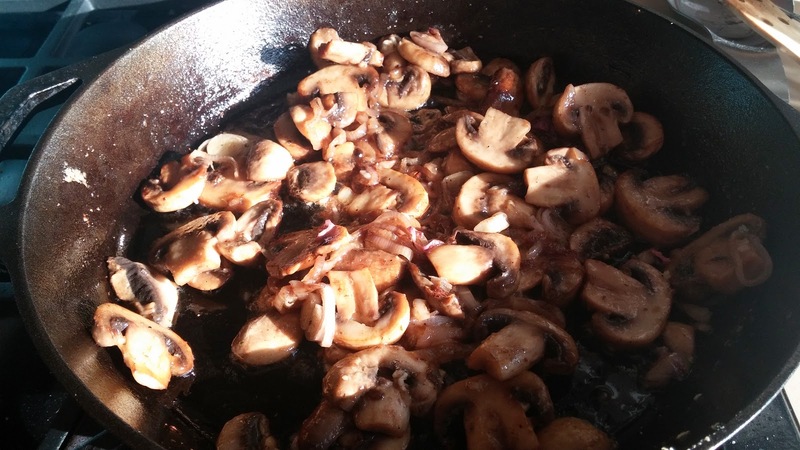 I had to add a little more butter to the pan to cook the mushrooms, shallots and garlic. Add the bourbon or if you want, whiskey. Bring this to a boil and let reduce, add chicken broth and balsamic. Reduce sauce by half and simmer. Slowly add in the heavy cream, continuing to stir. Add the pork chops back to the pan until heated through. 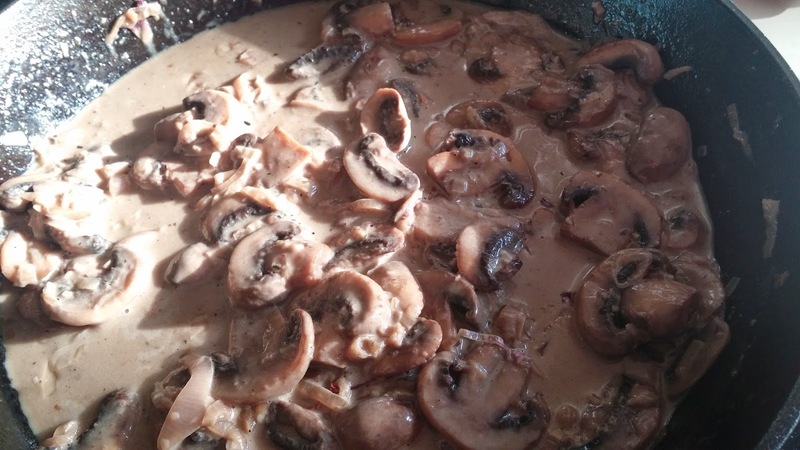 We will definitely make these again and I can see doing this sauce with pork tenderloin or a nice rib-eye steak. 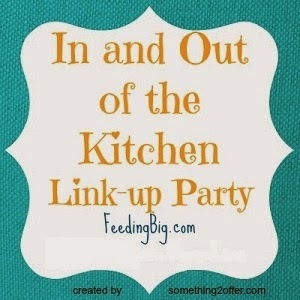 Linking up over at Feeding Big and Anyonita Nibbles.